In an earlier post, I detailed the difficult search for the story of Elizabeth Cohen and the lucky break I had in finding one little newspaper mention of a charitable donation that opened the door to the rest of her story: that she had first married Benjamin Heyman and had two children, Florence and Herbert, that Benjamin had died before Herbert was two years old, and that Elizabeth later married Bernard Sluizer with whom she had another child, Mervyn Sluizer. That was where the post ended. 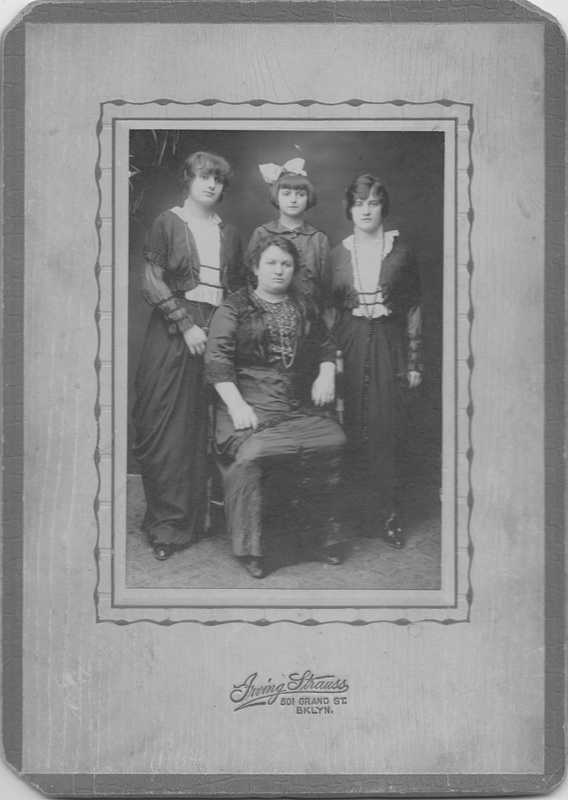 I have been very lucky again in finding one of Bernard and Elizabeth Sluizer’s great-granddaughters, Janet Elizabeth Sluizer (named for her great-grandmother, Elizabeth Cohen Sluizer). I now know more about Bernard and about their descendants including some photographs that bring these names to life. Bernard was the first born child of Meyer and Margaret (nee Lince) Sluizer, who were both born in Holland in the early 1830s. The records conflict as to when they arrived in the US, but by 1860 they were certainly living in Philadelphia as Meyer filed a Declaration of Intent to become a citizen that year and Bernard was also born in Philadelphia in 1860. 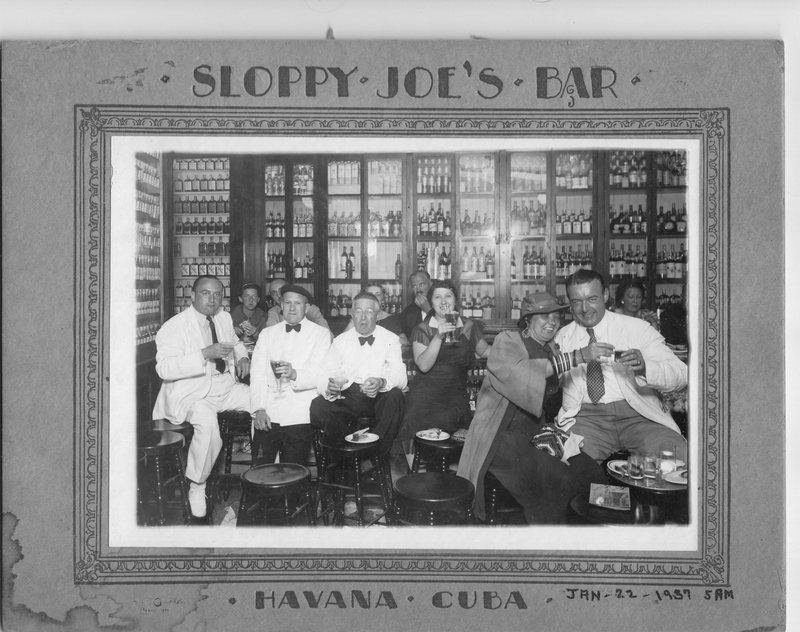 Meyer was first a tobacconist and later became a china dealer, according to several Philadelphia directories. He and Margaret had six more children, the last born in 1877. Meyer died in 1880, leaving Margaret with many young children still at home. Margaret lived to be 88, dying on August 20, 1921. Bernard, who was twenty when his father died, was employed as a salesman in 1880, but no specific business was given on the 1880 census. 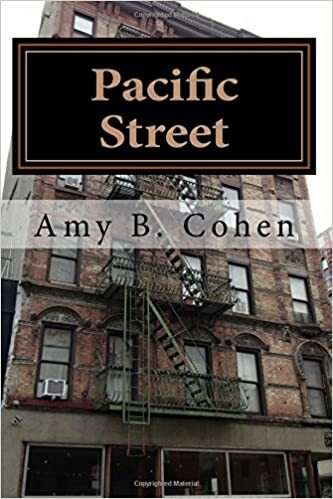 He remained a salesman of some kind at least until he married my great-grandaunt Elizabeth Cohen in 1892, when not surprisingly he became a pawnbroker. As I’ve already written, Bernard took in Elizabeth’s two children from her prior marriage to Benjamin Heyman, and then in 1893, Bernard and Elizabeth had a child of their own, Mervyn. Mervyn married Irma Wise in 1916 when he was 23 years old and she was 21. Mervyn also became a pawnbroker, working in his father’s store. Here is a wonderful photograph of Bernard (far left) and his son Mervyn (far right), working in his pawnshop. 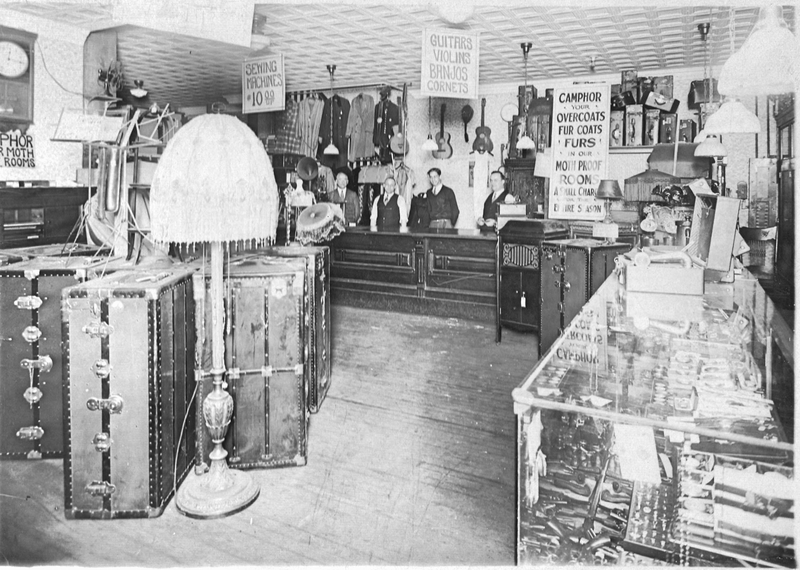 This is the first photograph I have seen of one of the many family pawnshops. I love the musical instruments in the background, the huge trunks in the foreground, and all the other signs and details that help convey a sense of what these stores were like. Mervyn and Irma had two children, Mervyn, Jr., born in 1920, and Margaret, born in 1924. Margaret must have been named for Mervyn’s grandmother, Bernard’s mother, Margaret. It is a little surprising that Mervyn did not name his daughter for his mother, Elizabeth, who had died in 1923, instead of his grandmother, but perhaps it was just too close to the time she had died. In 1930, Bernard, now a widower, was living with Mervyn, Irma, and their children. Sometime between 1932 and 1935, Mervyn and Irma divorced, according to their granddaughter Jan Sluizer. On the 1940 census, Irma was living with her two children, Mervyn, Jr. and Margaret. 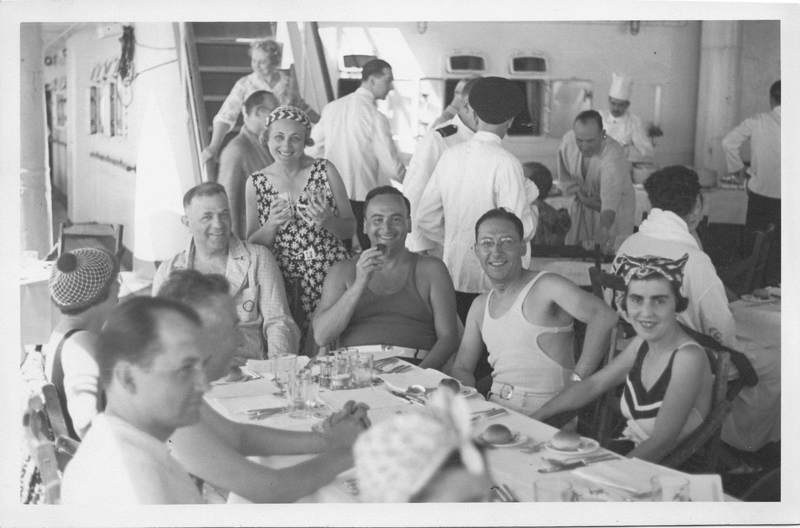 Mervyn, Sr., had remarried by 1940 and was living with his new wife, Anne, and her two children from a prior marriage, Bernard and Sidney Riskin. Mervyn Sr.’s father Bernard was also living with him and his new family. 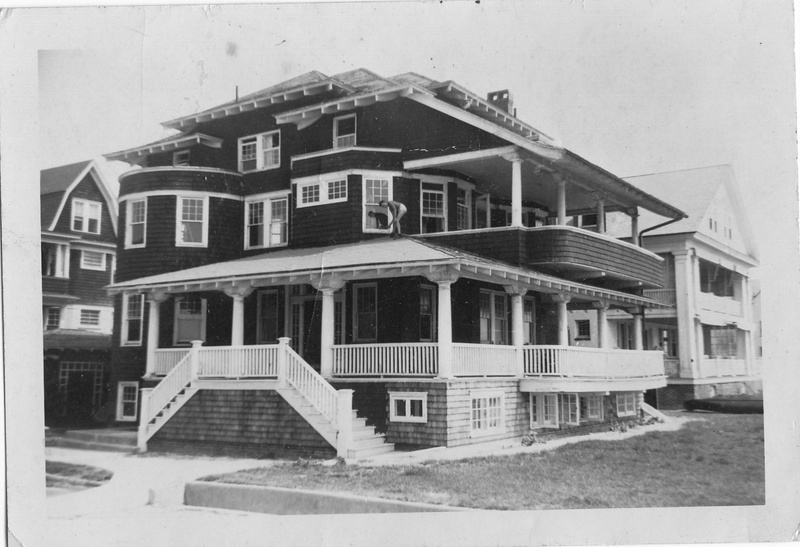 Mervyn, Sr., and Anne moved to Atlantic City sometime after the census and were living there for several years. 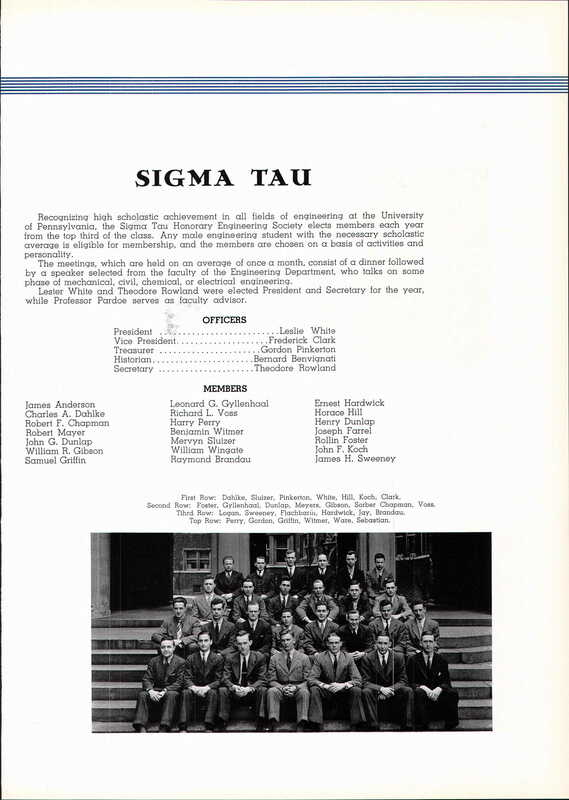 In 1941, Merv, Jr., graduated from the University of Pennsylvania, where he was an engineering student and a member of Sigma Tau, the engineering honor society. (Ancestry.com. 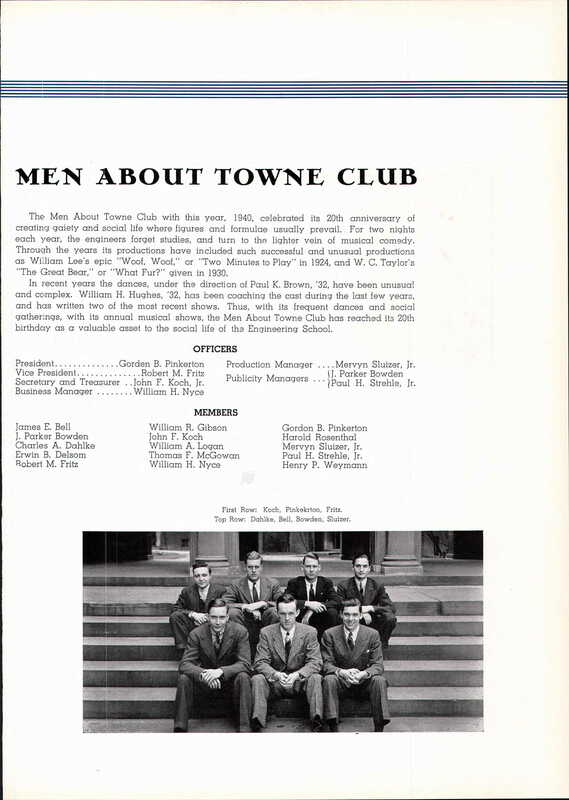 U.S. School Yearbooks [database on-line]. Provo, UT, USA: Ancestry.com Operations, Inc., 2010. Mervyn, Jr. and Shirley had two children, including Jan, the cousin who has supplied me with all of the wonderful photos posted here. Mervyn, Jr.’s sister Margaret also married and had three children. 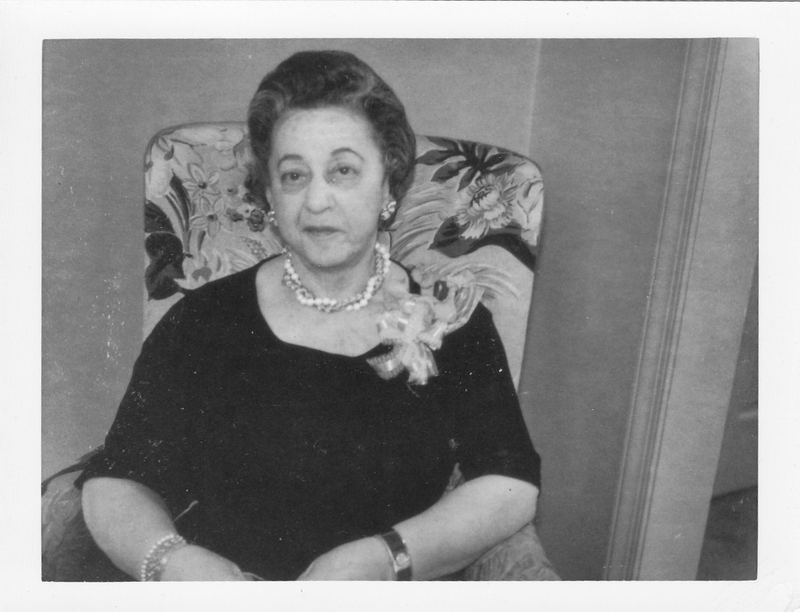 Her husband, Dr. Manfred Goldwein, had been one of the children who had been taken out of Europe to England on the Kinder Transport to escape the Nazis; the rest of his family was killed in the Holocaust. He became a medical doctor and one of the top rated doctors in Philadelphia. Jan also provided me with two newspaper articles about her father, Mervyn, Jr., including his obituary. Both portray a man who was a lifelong volunteer in his community and one who had a special passion for the Boy Scouts. The first article, published by the Philadelphia Jewish Exponent in August, 1962, when Mervyn, Jr., was 42, described his history of service to his community. 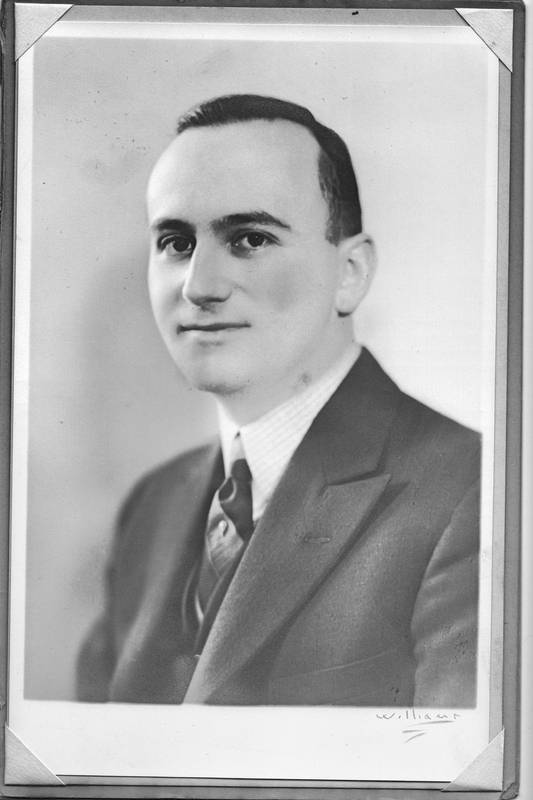 According to this article, Mervyn, Jr., was active in the Allied Jewish Appeal in Philadelphia and had recently been named Chairman of its Metropolitan Division after serving as Vice Chairman and also playing an active role in the organization since 1948. He also was active in B’Nai Brith and on the national board of trustees of his college fraternity. He had been actively involved in scouting since he was a boy and was at that time the scoutmaster of Troop 185, which was affiliated with Adath Jeshurun synagogue. 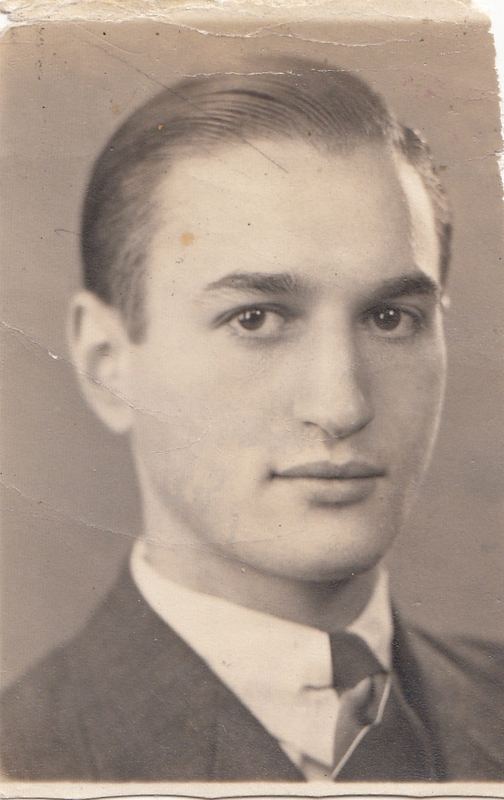 Mervyn Jr.’s grandfather, August Wise, his mother’s father, had been one of the founding members of Adath Jeshurun. 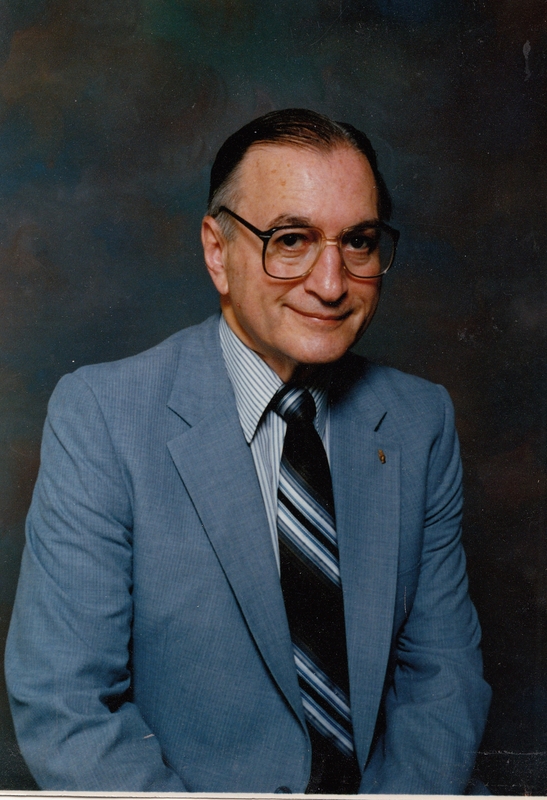 Mervyn was himself a member of Beth Tikvah synagogue and served at one time as its president. Mervyn Sluizer, Jr., died on October 12, 2000. He was eighty years old. 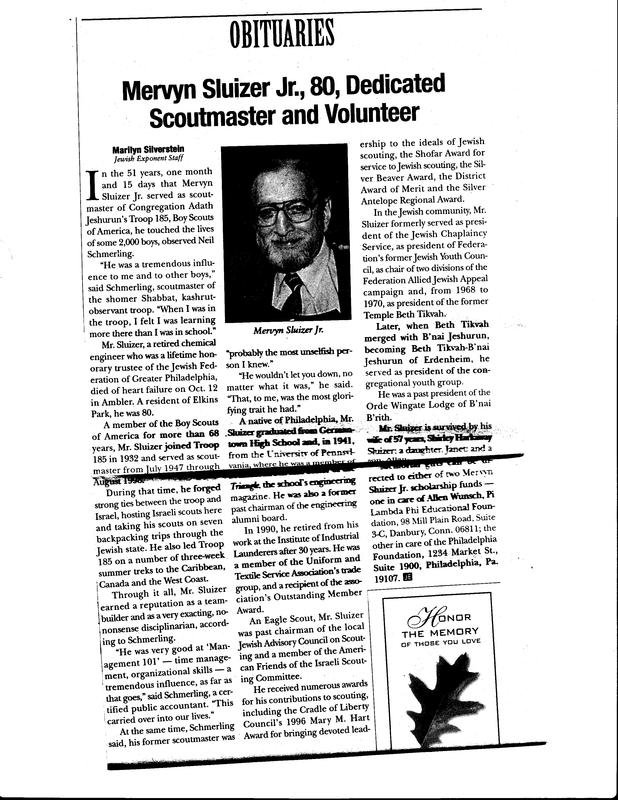 The obituary below, which appeared in the Philadelphia Jewish Exponent, also portrays a man who lived a full life, dedicated to service and to his profession as well as to his family. There is a scholarship in his name created by alumni of his troop, Philadelphia Troop 185, to honor his memory and to provide financial support for Philadelphia area Boy Scouts pursuing higher education. It is specifically provided to Eagle Scouts, as Mervyn spent a great deal of time helping scouts achieve that difficult level of scouting. There is also a second scholarship in his name sponsored by his fraternity at the University of Pennsylvania, Pi Lambda Phi. 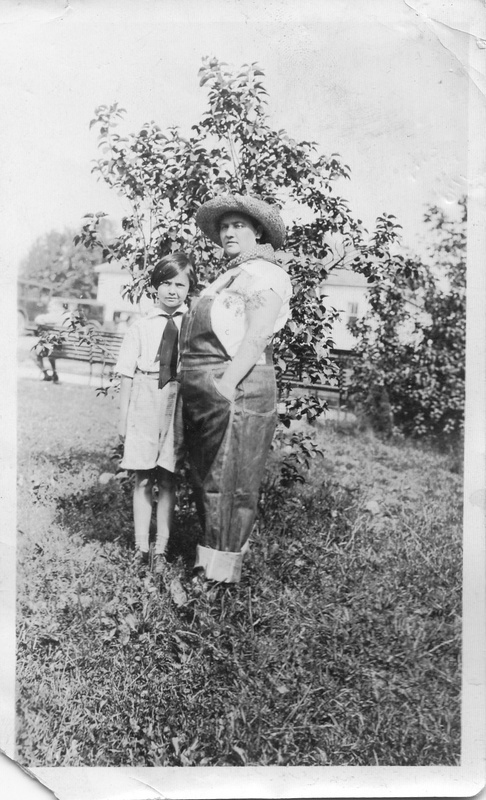 My great-grandaunt Elizabeth Cohen, who died when her grandson Mervyn, Jr., was only three years old, would undoubtedly have been very proud that he grew up to be such a generous and decent man, a college educated professional, one of the first in the family, and a man who gave so much to his community. He would have turned 94 just this past weekend on July 12. 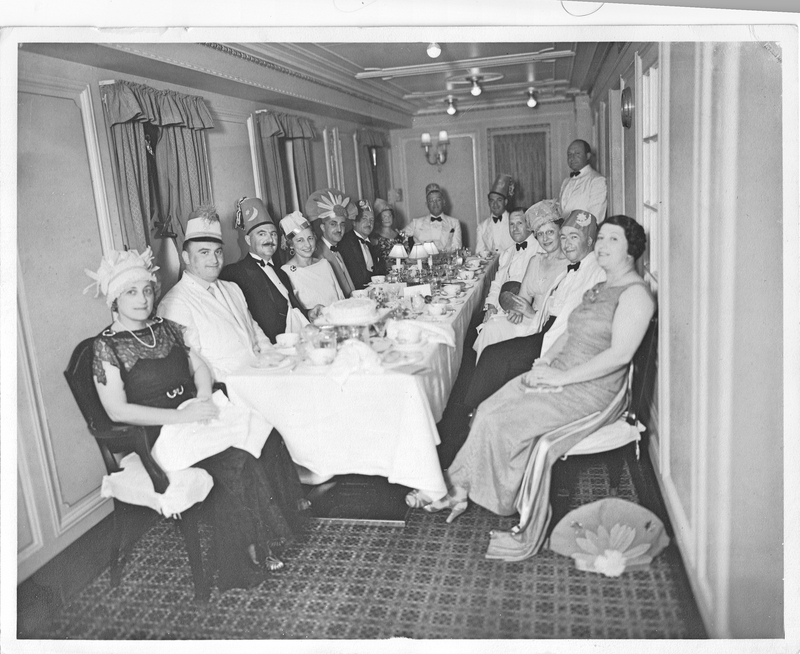 This entry was posted in Cohen, Genealogy, Miscellaneous information and updates, Philadelphia, Photos and tagged Boy Scouts, Cohen, Pawnbroker, Philadelphia, University of Pennsylvania by Amy. Bookmark the permalink. Great article! I believe Bernard Sluizer was my grandfather’s uncle. I am so glad you liked it, Matt. I will email you to see if we can pinpoint the connection! Thanks for reading and commenting. Very nice to see this. I had no idea that it was posted until my son, Marc, pointed it out. Joel Goldwein (Merv’s nephew, Peg/Margaret’s son). Hi Joel, Thanks so much for getting in touch. We are third cousins—both being descended from Jacob Cohen, father of your great-grandmother Elizabeth and my great-grandfather Emanuel. Your cousin Jan provided me with all the photos and much of the information in the blog post. I will email you separately.